Youtube is world’s most popular and biggest video sharing website. When Youtube was created, no one ever thought that a publicly contributed video website can pull it off so big. You won't believe how vastly hugely it is. You may think Facebook Video is big, but that’s just peanuts to YouTube. Most of you know that it is a video sharing website owned by Google where users upload, view and share videos. 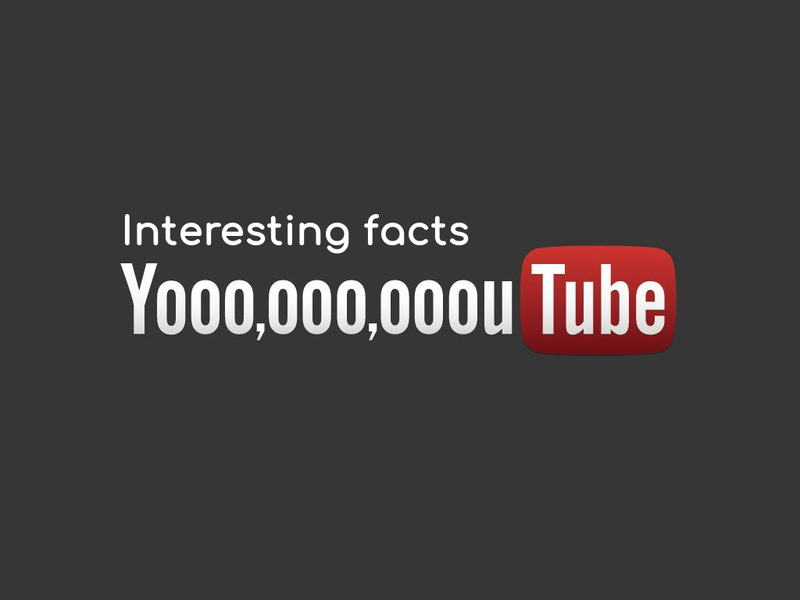 But, here you can find some interesting know unknown facts about your favourite youtube. eBay and Paypal role - YouTube is the mastermind of Chad Hurley, Steve Chen, and Jawed Karim. The three founders knew each other from working together at Paypal. In fact, YouTube was initially funded by bonuses received following the eBay buy-out of PayPal. You could argue that if there was no PayPal and eBay, there would be no YouTube. Original intention - YouTube initially was meant to be a dating website but as the destiny played its own games, what we got today is simply amazing. Misunderstanding Domain - YouTube.com was registered on Valentine's Day in 2005 and it caused a huge misunderstanding for Universal Tube. Its company domain, utube.com was overwhelmed with traffic from people that tried to spell the video site's name phonetically. Later the company changed its domain name as UTubeonline and the confusion among the customers/users of both the companies was cleared. Grabbed by Google - In the very next year of the inception of YouTube, Google accrue at huge $1.65 billion in November 2006. First video - The very first video on YouTube was launched at 8:27 PM on Saturday April 23rd, 2005 where one of the co-founder Jawed Karim posted the video titled "Me at the zoo" of his visit to the San Diego Zoo. More views from outside the US - YouTube says over 80% of views were from outside the US. But, they didn’t say which country topped the charts. Uploading frequency - More than 300 hours of video are uploaded to YouTube every minute. It has been found that more videos are uploaded to YouTube in 60 days than the 3 major US networks created in 60 years. Top 3 most watched videos - See You Again - Wiz Khalifa's song is the current most watched video followed by Gangnam Style and Despacito. Gangnam Style break YouTube’s original count limit - Psy’s Gangnam Style video very nearly hit the 2,907,553,948 play count limit in YouTube. The coders were forced to quickly rewrite a few things to change the play count limit, so we can all aim for 9,223,372,036,854,775,808 plays now. High Definition content - YouTube has more HD content than any other online video site. Time needed to watch all videos - It is said that it would take over 1,700 years to watch all the video content on YouTube. Top most superhero of YouTube - Batman is the most popular of all superheroes on YouTube, with more than 3 billion views of 71,000 hours of video. Number of hits - YouTube crossed 1 Trillion hits, which means 140 views per person alive on earth. Most traffic from 30% videos - A YouTube software engineer revealed that almost all of YouTube’s traffic came from 30% of the videos, as lots of people are just uploading videos to share with family and friends. 2nd largest search engine - According to Alexa, YouTube is the 2nd most visited site on the Web and also 2nd largest search engine on the planet followed by Google. YouTube is bigger than Bing, Yahoo, Ask, AOL combined. Half of YouTube viewers are on mobile - It’s more than half of YouTube viewers are actually on a smartphone or tablet, probably hiding in their bedroom. You can play snake when buffering - Those moments when YouTube is buffering - press left arrow key to start a game of snake. Consume huge traffic of internet - Video and audio streaming continues to eat up the greatest traffic of Internet, where Netflix and YouTube are the main traffic culprits. According to Global Internet Phenomena Report, YouTube and Netflix together use more 50% of whole internet traffic. 10,000 advertisers - YouTube has signed over 10,000 advertising partners to date, including Turner and Disney. Hundreds of YouTube partners are making six figures a year. More than 75 different languages - Now you can navigate YouTube in more than 75 different languages, covering 95% of the Internet population. Los Angeles - YouTube has a production space in Los Angeles that is free to use if you have 10,000 subscribers. Oldest video - The oldest video of cats still on YouTube dates from 1894. Grumpy Cat - YouTube star Grumpy Cat earned more money than Oscar-Winning Actress Gwyneth Paltrow in 2014. Most disliked video - The most disliked video on YouTube is Justin Bieber's "Baby," with over 4,400,000 dislikes. Most searched tutorial - The most searched tutorial on YouTube is "How to Kiss." Censored Around the World - At various times, more than 25 countries have blocked access. All the usual suspects are there, as well as some surprises such as Germany, Finland, and Brazil.